I had a terrible day on Monday; things kept going wrong and I was so frustrated and annoyed. Instead of chilling out and focusing on the positive, I just complained. I hate when I do that! 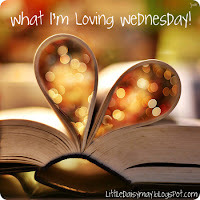 So today I'm linking up at this kind of love for what I'm loving Wednesday to remind me to be thankful for all the joyful parts of my day. I'm loving these sandals I paid $1 for! I can't pass up a good deal. I'm loving pasta salad with fresh veggies. I seriously could eat this all day long. it in years but it is SO good! after I learn a little bit more! Only a dollar for those sandals!?!? I'm jealous! Very cute sandals! And for 1 dollar! What a deal! Great post and congrats on the camera. Your blog cover photo is so cute with your hubby. 3. The thunder storm going on at the moment. ALSO pretty romantic! Congrats on the new camera! DSLRs are so much fun to use and the quality of the photos are fantastic. AW sorry you had a sucky day Monday...Mondays can do that sometimes ;) I DO love the things you love though..I have the same camera! I love it!!! Let me know if you have any questions regarding settings..it took me so long to figure it out. Nothing like surprise money for extra Starbucks! I love my Canon camera too! hi, thanks for stopping by my place, nice to 'meet' you. wonderful things to love, and yay for a new camera. you have to see the post of mine, because of the sandals!